Drug testing employees or candidates for employment can be pretty complicated, but with Medical Disposables’ Saliva Screen Oral Fluids Drug Test, drug testing can be quick and hassle free. This saliva drug test kit detects 10 different drugs and is extremely sensitive to THC, even at very low levels. This easy to use and easy to read test is perfect for staffing agencies that must screen candidates, and is also ideal for employers and home test use. To use this product, simply have the subject swab the inside his or her mouth and keep the swab inside until the indicator turns red, or up to seven minutes. Then place the donor’s sample into the provided cup, sponge first. It is important to make sure the test cup is resting on a flat surface, and that the subject has not consumed anything, even gum, in the ten minutes prior to the test. The easy to decipher test results can be read within a few minutes of completing the test. Testing saliva to detect drug use is much easier than testing urine, especially when considering that many employers must test employees relatively frequently. A saliva test can be done without an expert’s help and without the use of urine. A urine test can be invasive, especially if done at a business during work hours or if a donor is uncomfortable “shy bladder” can occur. Many employers, staffing agency personnel, and even family members want to know whether or not someone has used marijuana recently. This saliva test gives a more precise timeline of drug use, registering THC metabolites associated with recent usage, within the last 72 hours, rather than from older usage. 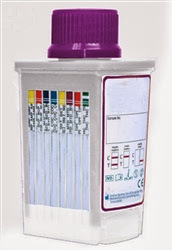 It is harder for a person to compromise a saliva drug test than a urine test. Because there is less need for privacy during an oral drug test than a urine test, the person who must pass the drug test cannot switch the samples. This test is also harder to fool with common products such as special drinks that can be used to pass a urine drug test. The MD Saliva Screen- Oral Fluids Drug Test can also be used to test for an array of substances such as cocaine, methamphetamines, oxycodone, and methadone.